I’m wondering how many of you have more than one engagement ring that you wear on your left hand and rotate. 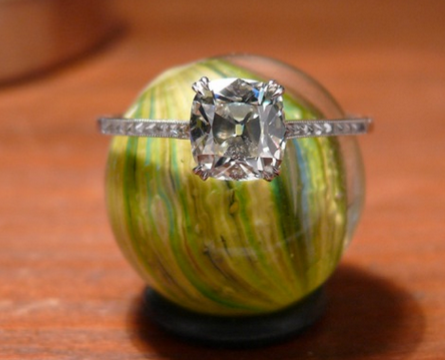 I’m never trading in my engagement ring but one day would like to have an alternate..Please show me yours! I tried to edit the title but can’t..It’s supposed to say How..
Matthews1127 and Starfacet like this. I have Eleanor (2.16 J-VS AVC in CvB Acacia platinum/yellow gold setting), Lucy (1.16 H-SI OEC in an original white gold Art Deco setting), Abigail (1.25 G-SI MRB in a vintage inspired white gold Gabriel & Co setting), Elizabeth (1.39 O/P-SI Crown Jubilee in a rose gold LAD original diamond encrusted halo setting) and Lilliana (1.55 E-SI pear in a custom CvB platinum setting as seen in my avatar) that I rotate. I love being able to switch out my rings based on my mood. Blingalingaling, _lovesvintage_, DorotheaBrooke and 2 others like this. And working on an aug vintage emerald ring next year for a simple more low key band look. Acinom, _lovesvintage_, rinkyb and 6 others like this. Wow! I’m speechless..so I’m not weird wanting another one! Gorgeous rings! I was thinking of maybe a five stone! Do you know the sizes of the stones? Love your ring in your avatar! Yup! It’s a .91 ct center with .5 and .25 sides. Thank you! Love it! Your green and pink ring is pretty nice too! I missed your marquise! Omg! So gorgeous! What size stone is it? It’s a 2.2ct fancy light yellow . It’s being reset into a 18k yellow gold Colette style east west setting. My OEC I wear every day. This was an anniversary gift. Tiffany soleste. It is way too blingy to wear everyday. The double halo is just WHITE and it is too in your face. So sad that it just sits. If I don’t wear my OEC I would wear my five stone or my skinny single cut band. clcat120, _lovesvintage_, AV_ and 5 others like this. My e-ring is special to me but I wear whatever ring the mood dictates on my ring finger, and the same goes for the other hand. I also enjoy wearing all white gold one day and all yellow gold the next. For me, wearing a ring on my left hand signifies I am married, so that is good enough. I think I enjoy having a ‘wardrobe’ of rings than I would an upgrade. Dandi, elle_71125, bludiva and 3 others like this. I just have my pear cut. I sometimes wear my eternity on my right hand due to finger swell, which bizarrely is mostly in winter. I struggle with going from intense cold to central heating, so when my hands warm up from freezing they start to swell & burn. Off comes the eternity. In consistent summer heat my hands are fine. One day I hope to sell my pear cut & buy a Tiffany classic knife edge, around 1.3 to 1.5ct. Your pear is beautiful. My first engagement ring was a pear.. Thank you! What did you do with your original pear cut? It was the one that had a huge black carbon spot under the table. The pear was .60 and the carbon spot was about a third of it! I traded it in..I felt a little bad but everyone thought it was dirt and tried to rub it off! AceofHearts and Alex T like this. Matthews1127, DorotheaBrooke and Mamabean like this. I only have this ring currently, but I still have my ring from my previous relationship. _lovesvintage_, mrs-b, DorotheaBrooke and 2 others like this. Thank you @Mamabean It’s just over 3 carats. I don’t really wear right hand rings and seldom change my rings. I’m very boring and lazy. msop04 and Mamabean like this. Why would you need to wear anything else! I wouldn’t either! @LLJsmom I’m trying to learn about OEC’s..What color is it? It looks bright white to me.. This thread shows more pics of it before it was in this setting. In certain environments it can show a lot more color. My elevator at work has golden metallic walls and the diamond definitely shows color there, whereas my F MRB was bright white. In an MRB, I like higher colors. Lowest would probably be an H. In OECs, I love them in all colors. For a ring, it would probably be an L as my lowest. In earrings, O/P if big and well cut enough, are just fine. Here are mine, the first one is more anniversary band but sometimes you just want one ring. Third is a pink sapphire in platinum Art Deco setting. Matthews1127, suzanne2, caf and 2 others like this. I just read your thread for your search to find your upgrade..now OEC..You has the same feelings I have..but I’m not going for a huge upgrade and I’m not trading in my ring..I love my MRB although I wish it were a little bigger..I am addicted to the white sparkle..but love seeing all the gorgeous OEC’s. The closest I will get is an OEC cluster ring..if I can find one! Looove seeing all your pieces together as an ensemble It all just works and makes me love your jade bangle just a little more. I’ll need to take an updated family picture once all my resets are done. I’ve been busy this fall!